May. 17, 2017 | May 17, 2017 | Benedict Tan, M.D., has joined the University of Arkansas for Medical Sciences (UAMS) as director of neurocritical care, treating the most serious brain and spine cases in emergency and intensive care. Tan is the only neurointensivist in the state. His expertise comes to bear in cases such as stroke; brain hemorrhages; traumatic brain and spine injuries; myasthenia gravis; Guillain-Barre syndrome; meningitis; encephalitis; ventriculitis; neurological assessments in the ICU; and complicated post-operation neurosurgical patients. 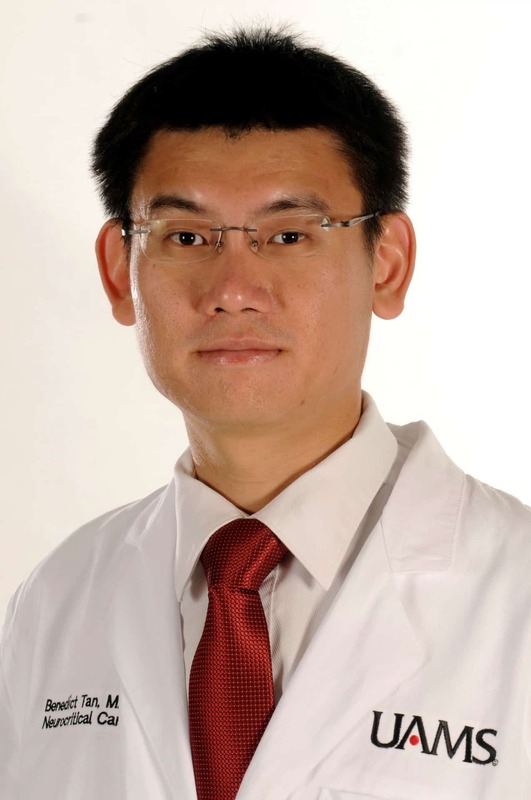 Tan is also an assistant professor of neurology and neurosurgery in the UAMS College of Medicine. In addition to treating patients, he conducts research, trains residents and is working to expand neurocritical care at UAMS with technology upgrades and the addition of neurocritical care staff. Tan earned a medical degree from Jefferson Medical College in Philadelphia. He completed a surgery internship at the University of Vermont in Burlington, Vermont; a neurology residency at SUNY Downstate Medical Center in Brooklyn, New York; and a neurocritical care fellowship at Baylor College of Medicine in Houston, Texas. He is certified by the American Board of Psychiatry and Neurology and is a member of the Neurocritical Care Society, serving on the Educational Product Committee. UAMS is nationally certified by The Joint Commission as an Advanced Primary Stroke Center. UAMS has the only comprehensive stroke treatment team in Arkansas, with one of only three stroke neurologists in the state. The stroke team includes Tan and interventional neuroradiologists, who provide catheter-based treatments of the brain, and vascular neurosurgeons. The Arkansas SAVES telestroke program links 51 hospitals throughout the state. Arkansas SAVES (Stroke Assistance through Virtual Emergency Support) enables a stroke neurologist to view brain images from a distant location. Neurologists can act quickly to interact with and examine a patient to determine whether the stroke is the type that can be treated by a special clot-busting drug that must be administered within 3 hours from stroke onset.